One lesson from Vermont's response to Irene is that the fabric of community and caring is a critical resource for recovery after a disaster. 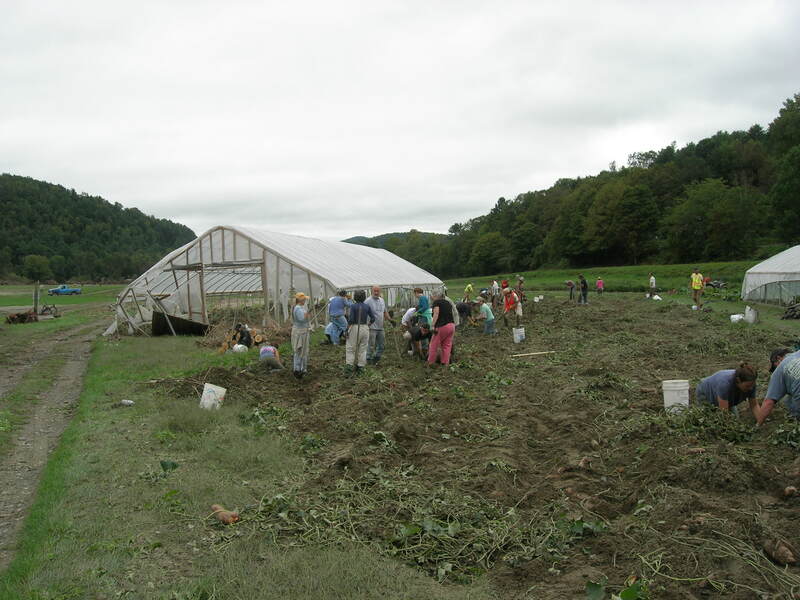 Shown here are volunteers at a damaged farm in Randolph, VT.
At the end of August, Vermont was hit by catastrophic flooding as result of Hurricane Irene, which dumped six inches of rain on already saturated hillsides around the state. On Saturday, I (Beth Sawin) was one of two panelists (along with Bill McKibben via Skype) asked to reflect upon lessons Irene and Vermont’s response to it might offer to all of us, as a part of the Vermont Beaming Bioneers Conference in Montpelier, VT.
1. Like it or not, we are entering a new era; it’s time to begin expecting the unexpected. 2. Given that there are limits to how much and how quickly communities, families, businesses and governments can adapt, we need to work harder than ever to eliminate heating-trapping greenhouse gas pollution. As members of impacted communities we have direct experience and the moral authority that we can bring to the climate and energy policy debate in the US and internationally. 3. Being prepared for extreme weather events may require new technologies and new infrastructures, but it also calls on, and can be served by, good old-fashioned community building. from strong local businesses to effective volunteer organizations, a lot of what was most helpful in the aftermath of Irene was a pre-existing web of connection and caring. 4. The window of opportunity for adaptation is during ‘normal times,’ not after a disaster. It is in our day to day planning and investment decisions that we make our world more resilient and better prepared for disaster. Immediately after a disaster the need to get ‘back to normal’ makes it very difficult to be innovative and experimental. These four lessons seemed well received by the seventy or so folks at the conference, many of whom lived through much more serious impacts than my family experienced here on higher ground. Especially my last two observations – that adaptation can happen every day with every decision, and that building connection with our neighbors can be an effective adaptation strategy – seemed to help people see that there a way all of us can participate in making our world more resilient and better prepared.